A short history of the attempted revolution in Brazil of 1918. The uprising failed when it was infiltrated by security forces, and the army did not join the side of the workers. 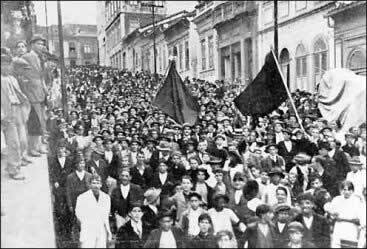 In 1918 Rio de Janeiro city was shaken by a series of events that would culminate in one the most important episodes in the history of the Brazilian workers movement: an attempted insurrectionary strike designed to bring down oligarchic republican government and replace it with workers’ and soldiers' councils. From 1917 on, the class conscious Brazilian workers, particularly in Rio de Janeiro and São Paulo had been organising at an accelerated rate. In July that year, the capital of São Paulo state had ground to a halt due to a general strike triggered after the police murder of a young shoe maker, Antonio Martinez. For four days the city was turned into a battlefield with countless clashes between the workers and the security forces. In Rio de Janeiro, which was the national capital in those days, militants from the FORJ (Federação Operária do Rio de Janeiro - Rio de Janeiro Workers Federation) had been busy since the beginning of the year in a campaign against the cost of living and, from February on there had been rally after rally in spite of police bans. By May nearly 50 had been held. Alongside this process the FORJ was carrying out painstaking work to organise and reorganise trade unions and by the middle of the year this was starting to bear fruit, with the establishment of the Civil Construction Workers Union (UOCC) on 4th April 1917 and the Textile Workers' Union (UOFT) on 8th April. Brutal repression of the strike at the Corcovado Textile Plant in May and the tragic collapse of the New York Hotel on July 7th with the deaths of dozens of workers exasperated the carioca (meaning someone from Rio) workers. On July 17th 1917, after a gathering at the FORJ headquarters, the decision was made to go on strike. That strike quickly spread to a number of industries, strengthening the trade unions, which experienced dizzying growth from then on. 1918 opened under the shadow of the victorious revolution in Russia which triggered an irresistible wave of optimism and unrest in the conscious working class the world over. In January libertarian militants established the Rio de Janeiro Anarchist Alliance, a specific organisation designed for social propaganda. 1 March saw the establishment of the General Workers Union (UGT) to replace the FORJ which had been banned by the police after the general strike. In April, following a fortnight on strike, the shoemakers won the eight and a half hour working day. The carioca press started to speculate about a "planned general strike" and this drew a police crackdown on the UGT. With a state of siege decreed, the First of May was marked in trade union premises and in a big UGT-sponsored rally in the Theatro Maison Moderne in the Praça Tiradentes. A significant aspect of labour organisation that year was the establishment of countless suburban UGT branches for textile workers, metalworkers and construction workers. June and July saw countless strikes by cabinet-makers, marble workers, colliers, dockers and hat-makers, with several textile plants being brought to a standstill. On 3rd August, a strike was called for better wages and shorter hours of the workforce of the Conpanhia Cantareira (shipbuilders) and the Viação Fluminense (trams); it eventually took on the character of an uprising following clashes between the populace and the security forces in the Rua da Conceição in Niterói. Several troopers from the army's 58th Chasseurs defected to the strikers, two of them being shot dead in the exchange of fire. This raised workers’ expectations of forging an alliance with the lower ranks of the armed forces, as had happened in Russia. As the cost of living rose throughout the country there was an upsurge in strikes and demonstrations in virtually every state capital and industrial city. Again there were rumours of a general strike looming in Rio and this caused the upper echelons of the Republicans some concern. Meanwhile, in the city of Petrópolis in Rio state, the famished populace looted and fought with the police. Disaster struck at the end of September. Rio was hit by the ghastly Spanish flu epidemic which claimed the lives of thousands of workers by the end of October. The police rounded up workers active on the Committee to Combat the Epidemic as the capitalist class and the authorities (including the health authorities) fled to the safety of the towns in the mountains. By November, the epidemic was easing off, but starvation continued to claim hundreds of lives, especially in the more remote suburbs. The approaching uprising was presaged by a flurry of happenings and reports. The textile employers refused to heed the weavers' demands; the newspapers were filled with reports of the workers’ revolution in Germany, the ending of the First World War, and of Delfim Moreira standing in for the ailing elected President Rodrigues Alves on November 15. On November 18th, the weavers declared a strike in the mills in Rio, Niterói, Petrópolis, Magé and Santo Aleixo simultaneously. The metalworkers and construction workers threw their weight behind it. In the mid-afternoon, strikers began to converge on the Campo de São Cristovão. The police ordered them to disperse and tried to arrest the more agitated workers. The workers retaliated and shooting started. Two bombs went off at the police station and the crowds invaded the premises. Shortly after that, troops intervened to clear the police station and scatter the workers who were attempting to invade the army stores. The fighting spread into neighbouring streets and further cavalry charges scattered the rebels. Here there is something of a controversy: Edgar Rodrigues, in his 1972 book based on depositions from militants, argues that the workers, having learned from a captain that the uprising had been betrayed, kept things low key. According to Rodrigues, given that the government was ready for it, the uprising was doomed in advance. Be that as it may, the soldiers' treachery and failure to go over to the rebels put paid to the plans painstakingly worked out over months. The details of those plans were known in advance to the police and army. One serviceman, Lieutenant Jorge Elias Ajus, had infiltrated the movement and taken part in all of the meetings and was even placed in charge of the rebellion's military strategy. The plan was that after capturing the army's stores, the workers and mutinous soldiers would make for the city centre and attack the prefecture, Police Headquarters and the barracks of the Police Brigade. Meanwhile, workers from the southern zone were to attack the Palácio do Catete and the Chamber of Deputies, after which the establishment of a Workers' and Soldiers' Council would be proclaimed. In the early evening of November 18th all of the movement's "ringleaders" - José Oticica, Manuel Campos, Astrojildo Pereira, Carlos Dias, Alvaro Palmeira, José Elias da Silva, João da Costa Pimenta and Agripino Nazaré - were arrested. Almost 200 people were arrested; anarchist militants, workers (anarchist or otherwise) and "suspects". At the gates of the Confiaça factory, police killed the weaver Manuel Martins and wounded another who died a few days later. The funeral procession, even though banned, was escorted by hundreds of workers. In spite of violent repression, the weavers' metalworkers' and construction workers' strike dragged on for a further two weeks. On 20th November the repression led to the closure of these unions' premises and on 22nd November the UGT was disbanded by order of the federal government. The 1918 uprising was no starry-eyed adventure of little consequence; it was an attempt by the workers themselves to affect their liberation, based on their own experiences of struggle and organisation and their desire to see the yearned for social revolution made a reality.